The teddy Bear origin only stretches back to the beginning of the twentieth century but bears used as toys and mascots stretches back much further. However the early incarnations of bears as objects carved from wood or made from tin were far from the lovable bears we cherish today. In fact they were seen as rather fearsome and terrifying creatures to be weary of or revered. So How did these early scary images of bears turn into an object loved by children and adults alike for generations? Margarete Steiff was an influential business woman in Germany who although crippled by Polio ran her own soft toy company at the end of the nineteenth century. Around 1902 her nephew Richard Stieff began making drawings of a bear which could be loved rather than feared by Children. 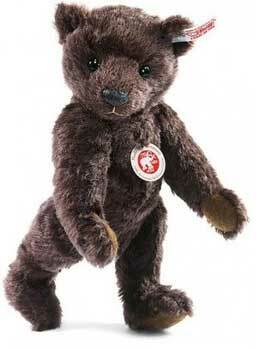 Richards first bear was not called a Teddy bear (it would six years before the company began to called their bears by that term) it was rather clinically called Bar PB55 (P for plush, B for Beweglich meaning movable). Margarete also did not like this first bear very much and encouraged Richard to continue refining the design. After many attempts to find the right design and several toy bears later, Richard finally in 1905 came up with a design which Margarete approved of, this bear was called the Bar PAB35. This bear took off in a big way and had sold 400,000 by 1906, this put the Steiff company firmly on the road to becoming one of the worlds premier Teddy Bear making companies. Theodore Roosevelt the president of the United States in 1902 went on a shooting trip whilst trying to sort out a border dispute between Louisiana and Mississippi. The shooting trip did not go so well and Theodore, Teddy to his friends, had not seen a bear all day. To help things along one of his aids decided to give a helping hand by capturing a old and frail bear and promptly tied it to a tree as a easy shot for the President. However the president was not happy with and considered it unfair sport and so refused to shoot the bear. 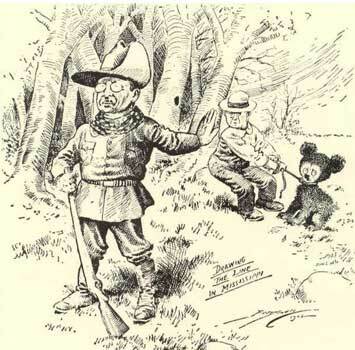 This story of Teddy Roosevelt's unwillingness to shoot a captured bear was reported in the newspapers and a cartoon of the situation was drawn by Clifford K. Berryman and printed in his newspaper. The public took the story and the president to their hearts and soon bears and the president's name of Teddy were inexorably connected forever. Soft toy bears began to be made and were called Teddy Bears after the incident. The most notable was made by a Russian immigrant named Morris Mitchem, whose wife created a bear which sold and sold until she could not cope with demand. A local company took over the production and the first American teddy bear manufacture was born, they were known as the Ideal Novelty and Toy Co. Many of the early manufactures did not survive, however a few went on to great heights and some even remain today. Here are a few of the first companies to make our furry friend. The Teddy became popular in Britain around 1908 but at this time and up to the First World War most bears were imported from Germany. 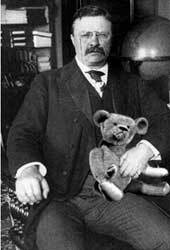 The first company to start making teddy bears is believed to be a company called J.K Farnell around 1908. Another early maker in Britain was Harwin and Co who were famous for making Ally bears which were dressed in various military uniforms. Sadly this company did not last long and closed in 1930. 1930 was also the year that the now famous Merrythought Company was founded and to this day still produces all British made bears.